"Data Lake Management: Big Data and the Cloud"
Can High Volume and Velocity Big Data Applications Run Successfully on a Cloud Platform? Some of the world’s largest companies are mothballing their behemoth in-house applications running on massively parallel processing databases in favor of cloud platforms. Whether on premise or off, you need to align the right set of skills when deploying big data in the cloud. 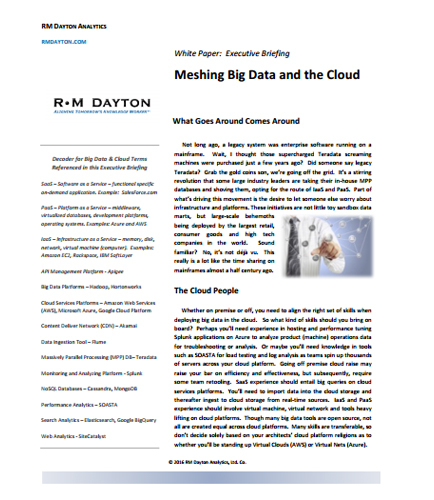 What skills do you need in deploying big data in the cloud? What are some of the technologies being used in near- and real-time large-scale cloud applications?